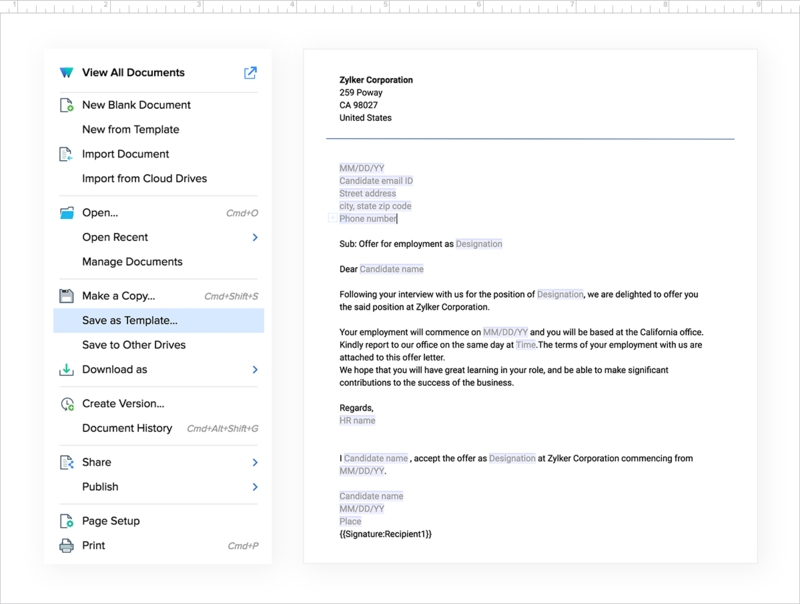 Certain functions in our organizations—like Payroll or Human Resources—work everyday with a combination of dynamic and fixed content to generate personalized letters, emails or contracts in bulk. The different merge tools in Writer are designed to make things easier for similar systems, leading to improved efficiency. Prepare master documents you can repurpose along the life cycle of your process. Share them with your teams and they can use them to generate multiple, personalized copies in bulk—without you having to edit them manually. 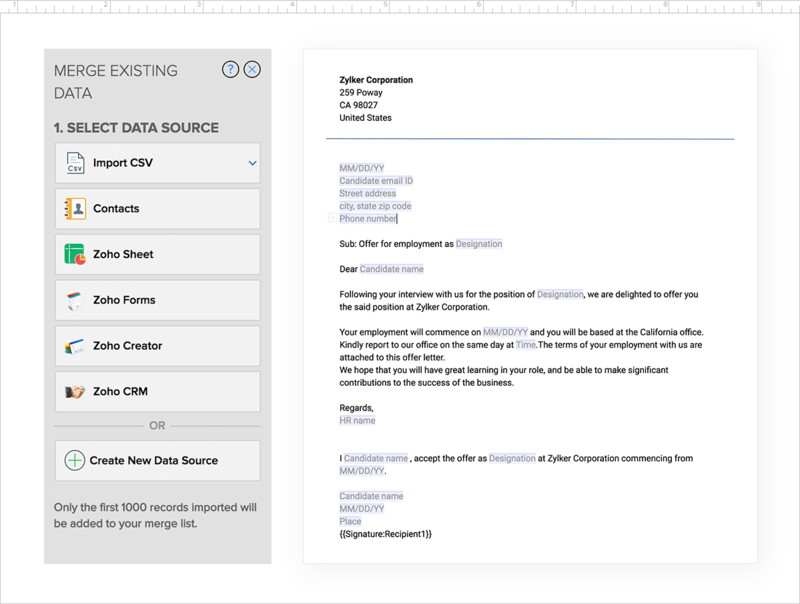 Bring data to your documents from a variety sources including Zoho CRM, Zoho Creator, Zoho Forms, CSV files and more. Use merge and signature fields to add tailor-made elements to your document (like the name of the recipient, for example). 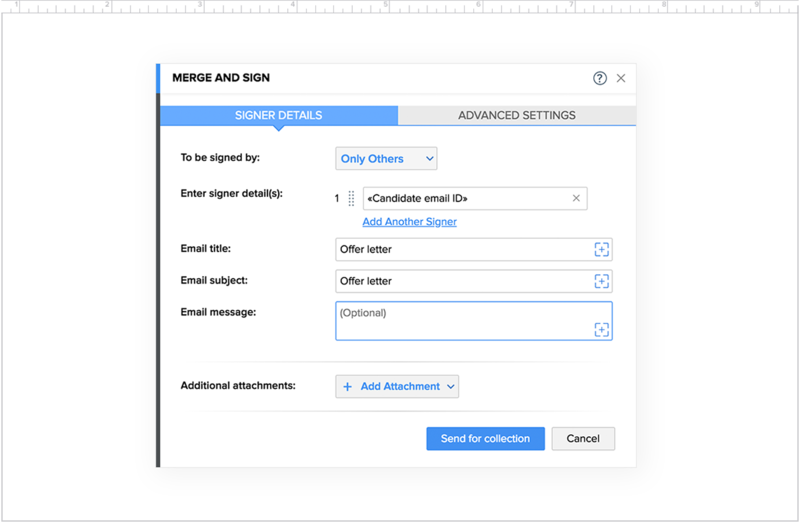 Your document gets customized automatically when you complete merging it or send it to our digital signature app Zoho Sign. 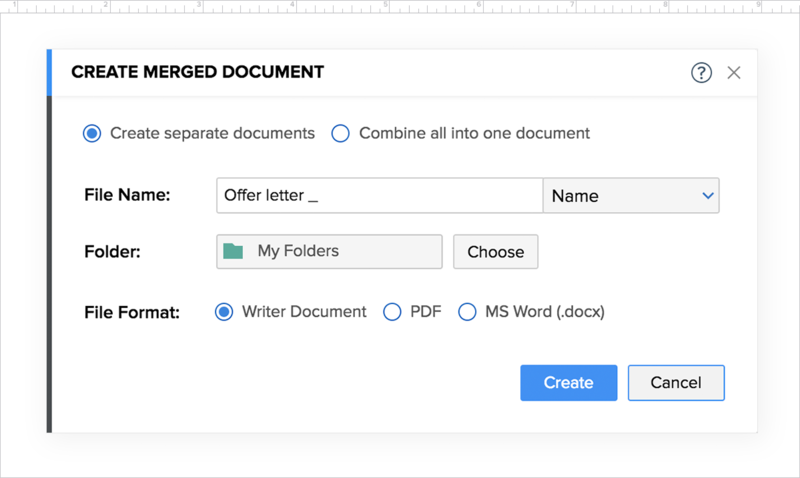 Writer gives you multiple output and delivery options for you to distribute your merged documents. The merged content can be sent out as mails, both inline or as a file attachment. Writer can automatically send merged documents to your signers to attain their signatures on the final copies. Choose where you want the merged documents to be saved . You have the option to merge all records into a single document or create a unique document for each recipient. Need Avery-compatible shipping labels and envelopes? 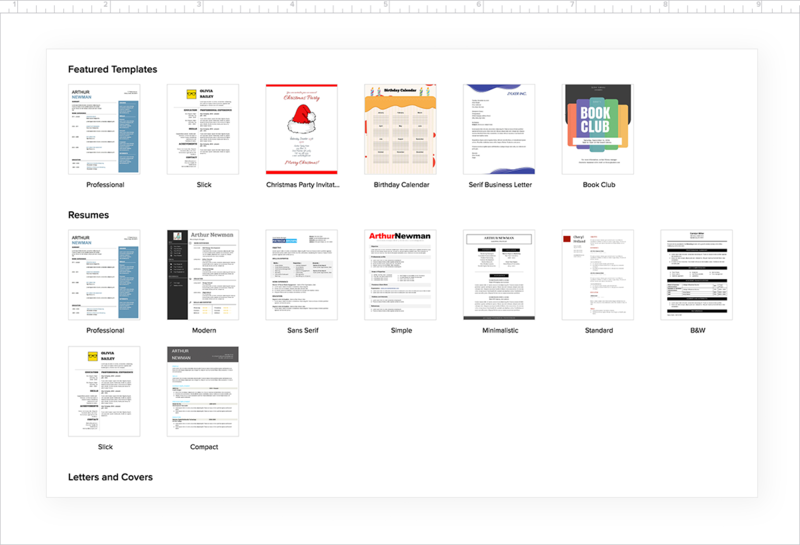 Our built-in templates have you covered. 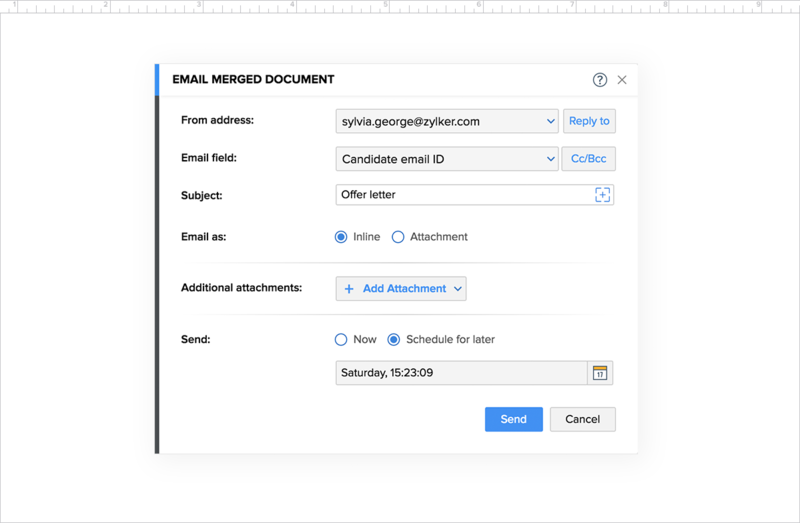 Mail Merge in Writer comes with scheduling and tracking options built-in, because staying up late to draft and send out mails isn't the best use of your time. Writer is just one of 40+ apps in the ever-growing Zoho ecosystem. Each one is designed to help you run your entire business on the cloud. 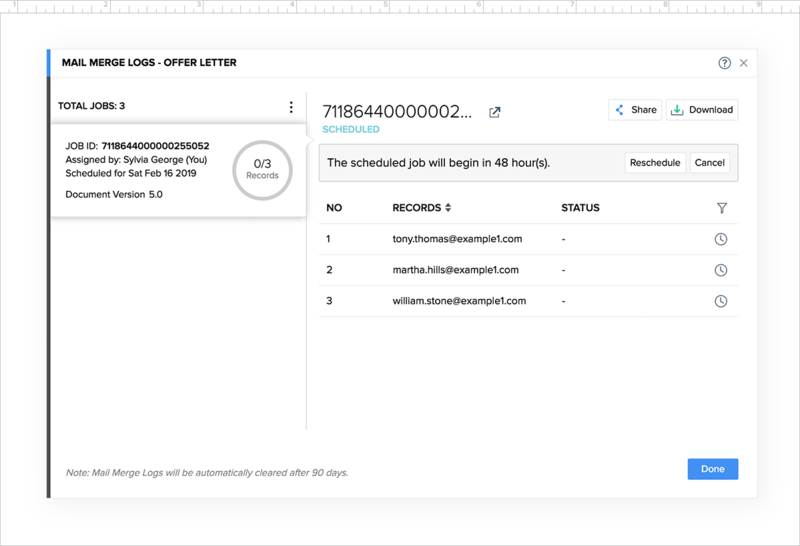 This close-knit integration means you can quickly create mail merges from your leads in Zoho CRM, or from your employee information in Zoho People and Zoho Recruit.